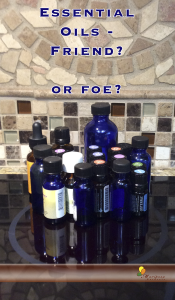 Essential Oils – Friend or Foe? Essential Oils: Friend? Or Foe? 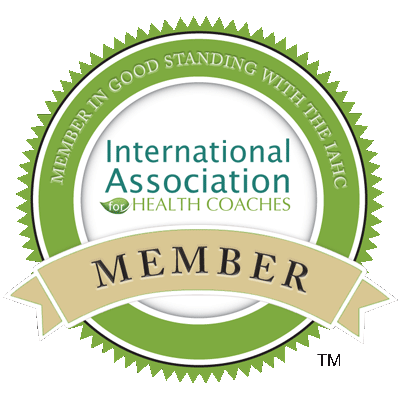 Have you seen the post about essential oils and migraines? I’m guessing that there are a lot of people that are bothered by essential oils, based on the popularity of that post. You might want to read it now, and the comments at the end. I’m not here to bash essential oils. I have seen firsthand the good that they can do. I also know that they are not for everyone and that they can be harmful, if used improperly. For examply: I recently attended a meeting where someone had applied liberal quantities of essential oils to mask the smell of skunk from their dog’s skunk encounter. It did very little to hide the skunk smell. And, because we were meeting in a small room, the EO smell was so strong that I developed a migraine. Proponents of essential oils (EOs) are often overzealous in their praise for EOs and insist that they can do no harm. I have friends who sell EOs and they are always eager to give me this or that oil. My problem with that is, too often, my complaint is a headache or a threatening migraine. And for me, EOs are just another strong chemical that can trigger a migraine, rather than helping. And based on traffic to the post I mentioned above, that’s true for a lot of people. Essential Oils actually are Volatile Organic Compounds (VOCs). Use them sparingly – a little goes a long way. If you know someone with extreme sensitivities, don’t use essential oils in their presence. If you share living quarters with someone with extreme sensitivities, don’t use essential oils at all. Dilute oils with a carrier oil before applying to your skin. Dilute oils with water before diffusing. Test a tiny bit of your diluted oil to see how you react to the smell. Consult an expert who knows about the safety of EOs before use. Hint: This may not be the person who is selling you EOs. If they insist they are always safe, you don’t yet have your expert. Know your source for essential oils. Crazy ways essential oils can do more harm than good. What are your thoughts? Do you use essential oils? Do you experience any ill effects from their use? Are you looking for a deodorant that is both safe AND effective? Check out Mariposa Naturals Deodorant! Pingback: Do Essential Oils Cause Migraines and Headaches? i believe that they cause problems with headaches especially if you are taking other medicines…..you should post that on your products before people buy them and spend a lot of money on them…. I bought essential oils from. Edens garden and doterra. I LOVE THEM. the smells are amazing. One problem. For two days I have had a head ach. I have owned my defuser for 2 weeks now and use it daily. 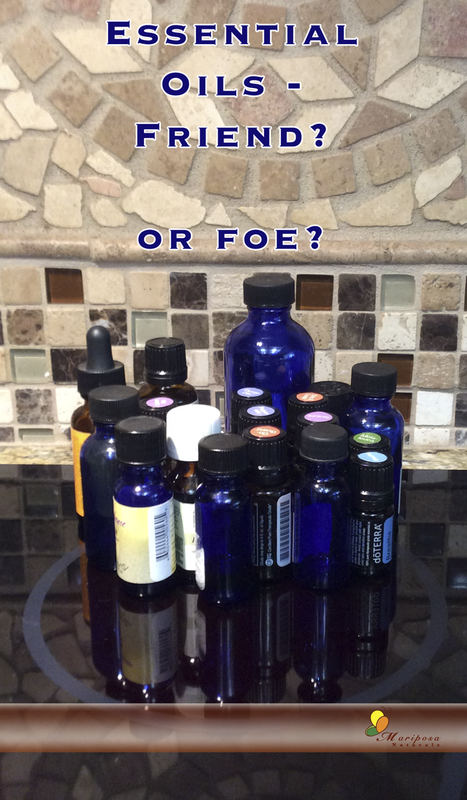 Also in the last few days I have used more drops of each essential oil I combine in my defuser. I’m thinking the drop increase is what’s doing it. Last night my daughter and I both woke up from headaches. I think I’m going to give it a good week before defusing oils again and when I do I’m not going to leave it on alllllll day like I was doing. Never new to have caution with essential oils before running across this post. I’m confused tho. Why don’t distributors of EO Caution their potential buyer about the health precautions before hand??? So sorry about your headaches. Essential Oils are highly concentrated, so a little goes a long way, especially when diffusing them. Many of them are unaware of the fact that some people are sensitive to their products. It would be nice if they let you know to use them sparingly until you know how they affect you, right? Came across your post today as I was looking to confirm a concern I’ve had for awhile about EO of which for the most part, I encourage folks to use–sparingly. No, I’m not a distributor. I have Trigeminal Neuralgia (facial nerve pain-shocks), Atypical Neuralgia (constant burning and aching like you need a root canal) and Chronic Migraines. Today, my sister (with good intentions) placed an opened bottle of EO Peppermint under my nose. Well, I had an IMMEDIATE bad reaction that included facial pain (like a serious sinus infection) which is still full-blown and a migraine from hell. I can’t tell you how painful this is or how bad my little sister feels. 🙁 Until I had TN different scents–including peppermint would not have made me negatively react. Thanks for your insightful article and confirming what my body told me today; that certain EO can trigger migraine and much more. I plan to find out EO manufacturer and warn my sister as she uses this oil everyday to open her sinus passages. I also have TN and recently started using essential oils. the last couple of weeks I have started having these horrible head aches. Teeth hurting pain around my eye so I have decided they m a y not be the best for me. Thank you for your information. I’ve been having severe sinus/migraine/allergy headaches. Had to tell them apart. Been using my new oils for 2 days now and developed a terrible headache lasting 2 days with vomiting. Stoped using EO right away, I need to get my life back. I’m going to try patch testing on my forearm to get a better picture. It seems that the EO’s are an irration to my mucus membranes when air born. I am so glad to read this. I finally had my migrants under control and then I started diffusing essential oils. They came back. Not only that but my chronic sinus/cough is back every time I diffuse. I also have found that certain oils cause my anxiety attacks. It’s happened often enough that it can’t be coincidinces. I thought I was going crazy because everyone I know just says how great they are. Obviously, they work opposite on me. Yikes, sorry to hear this. They can definitely impact the nervous system which could lead to anxiety attacks. I’m sorry that you, too, are having problems with EOs. Hopefully you’ll find the answer. Always remember that EOs are very potent. A little goes a long way. So, if you’re brave, consider diluting them. Peppermint EO gives me a headache! I know some recommend it to help with headaches but it’s definitely not for everyone. I can diffuse eucalyptus without incident. I’m glad to know I’m not alone.